The base of the card is a folded half-sheet of Basic Black card stock. On top of that is a piece of the "Birthday Memories" Decorative Series Paper (DSP) cut 4-1/8" x 5-3/8". The yellow layer is a piece of the same DSP cut 3-3/4" x 2-1/2" and the Basic Black layer behind it was cut 3-7/8" x 2-3/8". Next the 1" wide strip of Black DSP was taped down over the yellow layer. I used the Triple Punch to make the right ribbon looking end and then I trimmed the on the left side piece after I taped it in place. The Whisper White piece was cut 2-1/2" x 3-1/4" and the Basic Black layer was cut 2-5/8" x 3-3/8". 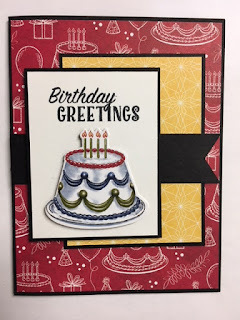 I stamped the greetings from the "Happy Birthday Delivery" set. I die cut the cake using the matching dies that go with the set. I set the layer in place using Dimensionals and then I set the cake in place with more Dimensionals. 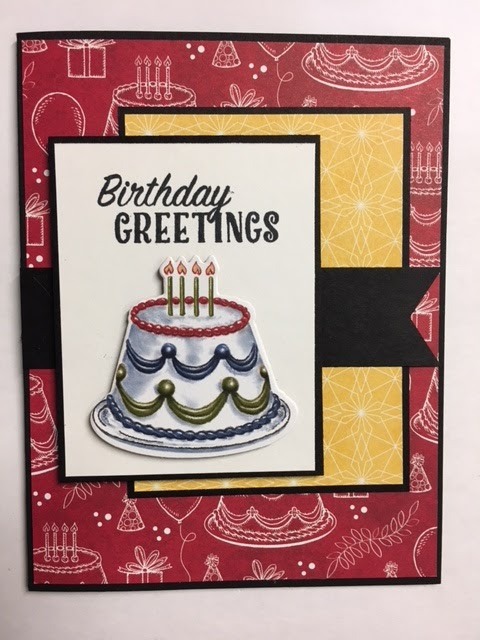 This is a very easy card to make and I really like the layout. Though if I were to make it again I would add a half inch to the yellow layer to make it longer so it would measure 4-1/4" x 2-1/2" and the Basic Black layer would be cut 4-3/8" x 2-5/8". And if I wanted a little more yellow to show, I would trim off the top of the Whisper White piece another 1/8". But I think the card looks great the way it is.